Syracuse, NY, April 12, 2013 - From the Central New York Boat Show in mid-February through the summer months, the 2013 Discover Clean and Safe Boating campaign educates boaters about all the gear required and recommended for legal, safe and environmentally-friendly boating on New York's waters. 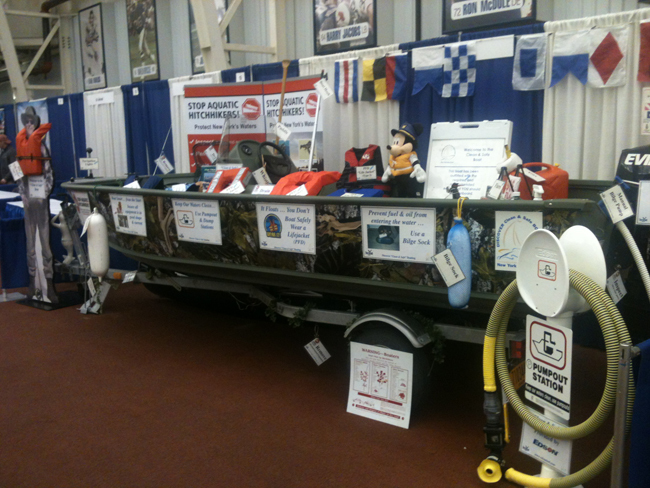 The centerpieces of many of these seasonal boat shows are the 2013 Discover Clean & Safe Boats. The 16-foot ‘made in New York’ Grumman fishing boat and Ontario II canoe are equipped with all the gear required and recommended for clean, safe, and legal boating on New York waters. New York Sea Grant (NYSG), the Boating Industries Association of Upstate New York (BIA), and Marathon Boat Group are sponsors of this year's educational campaign, which campaign developer NYSG Coastal Recreation and Tourism Specialist Dave White says, "engages diverse audiences throughout the Great Lakes region and across New York State with information on easy-to-implement clean and safe boating practices. Our focus in 2013 is also on educating anglers and paddlesports enthusiasts about how to be safe on the water and how they can help reduce the spread of aquatic invasive species." New with the 2013 exhibit coordinated by New York Sea Grant is a sewage pump out system pedestal-and-hose array provided by Edson Pumps Marine Division, New Bedford, MA. “New York’s Great Lakes will soon be designated No Discharge Zones, so we equipped the 2013 Discover Clean & Safe Boating exhibit with a pumpout array to educate boaters about the coming new environmental requirement for boating on Lake Erie and Lake Ontario,” says White. The U.S. Environmental Protection Agency defines a No Discharge Zone as an area in which both treated and untreated sewage discharges from vessels are prohibited. The Discover Clean & Safe Boats exhibit includes information on voluntary watercraft inspection and invasive species factsheets. Eleven of the people attending the in-water life jacket and paddlesports safety demonstrations - sponsored by New York Sea Grant, U.S. Coast Guard Auxiliary, Full Throttle Life Vests, Syracuse Pool & Patio, Marathon Boat Group, and Morgan Recreational Supply - won prizes. 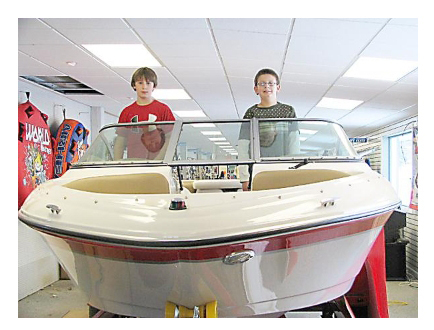 Jacob (left) and Adam Cooper, seen here at Cooper's Marina in Baldwinsville, earned their Young Boater Safety Certificates at the 2010 Central New York Boat Show. 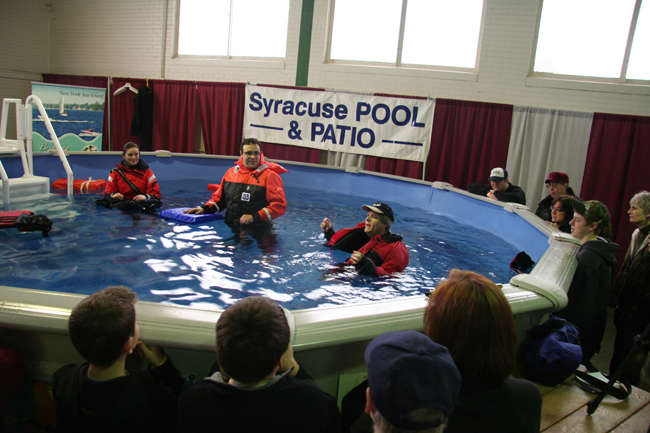 The training program was offered again this year in February by the US Coast Guard Auxiliary and New York Sea Grant at the Central New York Boat Show at the NYS Fairgrounds in Syracuse, NY. Successful completion of the free 8-hour two-part course and proctored exam is required for youth to legally operate a motorized boat or watercraft alone on New York State waters. Photo courtesy of Cooper's Marina. As seen in this clip from Watertown, NY-based WWNY TV 7, Dave White, New York Sea Grant's Great Lakes program coordinator and recreation/tourism specialist, discusses the Central New York Boat Show. Prior to the Show, White talked to WWNY-TV's morning hosts about the in-pool demonstrations of the different types of personal floatation devices (PFD) that he would be conducting. "We're doing two different kinds this year - one on paddlesports, the largest growing component of the boating industry," says White, citing kayaking and canoeing as examples. "So we have a 12-foot canoe in the pool and we'll be talking about paddlesports safety." One of the regulations that has changed - recreational users now need to have a wearable PFD on board for everybody in a canoe. During the four-and-a-half minute segment, White provided viewers with some on-camera demonstrations of PFDs as well as helpful tips for safe boating. Since April 2006, White has been bringing Sea Grant's "message" to the morning masses at WWNY TV 7, a Fox affiliate in downtown Watertown, during one of the highest rated TV blocks in the "wake-up hours," the 6:30-7 am stretch. For several years now, New York Sea Grant and the Boating Industries Association have partnered with Your News Now to provide a monthly Discover Better Boating series that begins in the Spring and wraps up in October. In addition, White occasionally is featured in YNN segments outside of the series, such as the one seen above from the Central New York Boat Show. While at the Show, White was visited by a YNN reporter who got some first-hand insights into the campaign's life-vest, canoe and in-pool demonstrations. The YNN channel, based in Syracuse, telecasts two separate program feeds, one to Central/Northern New York; one to the Southern Tier. YNN is available to nearly 600,000 cable subscribers across a 25-county, 15,000 square mile area. For more information on the Discover Clean & Safe Boat, contact White at NYSG's SUNY Oswego office, 315-312-3042 or click through the "News" section of www.nyseagrant.org/marina. New York Sea Grant (NYSG), a cooperative program of Cornell University and the State University of New York, is one of 33 university-based programs under the National Sea Grant College Program (NSGCP) of the National Oceanic and Atmospheric Administration (NOAA). The NSGCP engages this network of the nation’s top universities in conducting scientific research, education, training and extension projects designed to foster science-based decisions about the use and conservation of our aquatic resources. Through its statewide network of integrated services, NYSG has been promoting coastal vitality, environmental sustainability, and citizen awareness about the State’s marine and Great Lakes resources since 1971. For updates on Sea Grant activities: www.nyseagrant.org has RSS, Facebook, Twitter, and YouTube links. NYSG also offers a free e-list sign up via www.nyseagrant.org/coastlines for NY Coastlines, its flagship publication, and Currents, its e-newsletter supplement, each distributed 3-4 times a year.